Calving season started late. Desiring fall calves, I get winter calves as it was almost February before breeding began. This year, calving season at our Cross-Dubya ranch began on Thanksgiving Day with a little heifer we named “Giblets.” We’ve had other calves, but there’s always something special about the first one each year. Anyone who has ever worked with livestock knows calving sometimes comes at a high cost. This year, I destroyed a bull calf unable to sustain life on his own shortly after his birth. 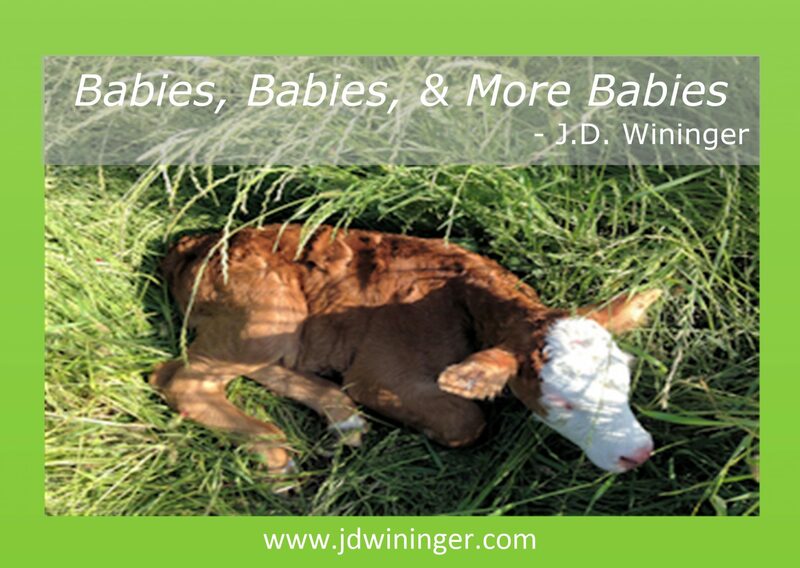 I have a sixty-day breeding window for my cows; followed by a nine-month gestation. When something goes wrong and you lose a calf, you have lost a year’s worth of feed and care with little or no return. Worse yet is when you not only lose the calf but also the mama. There’s a saying among longtime ranchers here in Texas, and maybe elsewhere. If you haven’t lost one yet, you’re fixin’ to. Through it all, I focus on the positive. When bad things happen, I lament them, but I thank God for the many more good things that happen in my life. I have far more healthy calves than sick ones, and for that I praise God each day. I watch the new mamas and their calves. The cycle begins again in a few months. Sadly, some of our babies never make it to maturity. Their life cycle gets interrupted. I think how this cycle of life continues in our world and wonder how it relates to my writing. In ways, the books, devotionals, and articles I write also experience a life cycle. I start with a thought or idea, the give it lots of prayer and more thought until a storyline develops. Then we write drafts and set them aside to mature and then massaged more. More research, analysis, prayer, and edits applied. In time, we write and submit query letters and book proposals. Upon acceptance, the next growth stage of our baby begins. With each stage, the manuscript takes shape. When we apply enough polishing and care, we introduce our word-child to the world. With the right care and feeding—in the form of marketing, promotion, etc.—they take their place in the world. Calves, barn cats, or books, our babies each have a unique place in this world. Some will impact the world; others have minimal impact in their local community. Still, others will impact lives in ways that are only know in heavenly places. I pray whatever you birth; cow, lamb, child, idea, or book, it reaches full maturity and brings glory to God through the care and feeding you put into them. ← How Do I Top That? I always love the lessons we receive from nature. My father raised Hereford/Angus cows and I spent many hours chasing those rascals when they escaped. I appreciate the connection you make between the maturity of the calves and us as writers. We can learn so much if we just take the time to study God’s awesome creation. Thanks for the inspiration and the memories. Happy 2019! Laughed as I read your comments Ms. Katherine. I was just chasing one of my neighbors Angus calves who decided to attempt an escape a bit ago. They can be slippery little buggers can’t they? Thank you for your kind words ma’am. Babies are babies, not matter the breed or genre. God’s blessings ma’am. In my 33+ years of boarding horses, we had many foals (some were my own). A few died at birth (or not completely delivered) a few mama’s died and I had to feed the new foals myself. But those who survived and thrived always sent a thrill and joy through my heart as they bucked and cavorted… grew leggy and awkward, and turned into fine mares and… geldings. Thanks Ms. Jackie. It is heartbreaking to lose an animal, but we learn not to dwell on our loses and choose to focus on all the blessings in our lives. Am learning to do the same with my writing also. Although I’m still wondering why every manuscript I write isn’t a bestseller (smiling just writing this). God’s blessings ma’am. I enjoyed reading your analogy. God’s creation gives us so many examples of His amazing plan. Thank you for sharing, J.D. God richly bless you in this New Year. Am humbled by your words Ms. Connie. Thank you so much for your encouragement and your kindness. You show me how richly blessed I am ma’am. God’s blessings. Your post brought a smile to my face imagining the baby calves. God’s creation never ceases to amaze me. Thanks for reminding us of the connections of nature in our lives. Praying for many blessing in 2019 for you and yours, J.D. Thanks Ms. Beckie. I smile often when I see them “high-tailing” in around the pasture; jumping, playing, and enjoying life on the outside. Many blessings for you and your family also ma’am.